You know what would have been a great annual? Daredevil #17. The story featured in it was tied to the larger storyline of the ongoing book – obvious perhaps, since it was an issue of the actual series – but it also worked well as a stand-alone story. However, the logic behind how annuals come about isn’t always straight-forward. Sometimes, they clearly reference things that are currently going on with the character (such as the 2007 annual written by Ande Parks and Ed Brubaker), sometimes their existence seems much more random. In this case, the annual that came out a couple of weeks ago was written by a different writer (Alan Davis, who also supplied the pencils), and part of a completely different three-part story which played out across the Marvel Universe. 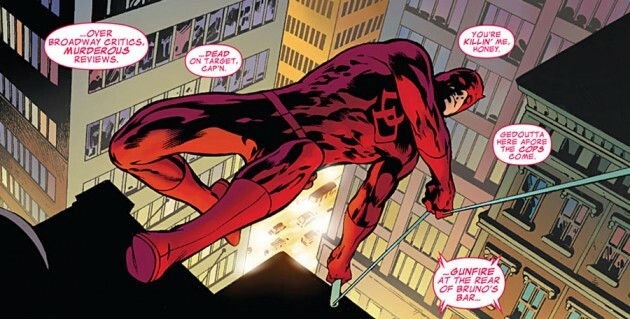 Because Davis’s own creation, the group known as the ClanDestine, is the common thread that runs through each chapter of the story, Daredevil fills the role of guest star in his own annual. This post cannot legitimately be called a review since I don’t have that much to say about the story itself. The artwork is pretty good, the story is technically solid, and there’s nothing wrong with it per se. I just didn’t find myself to be all that taken in by it. However, it did cause me to think about the ongoing Waid run on Daredevil, and remind me once again why it, to me at least, seems much more modern than what is often suggested by the labels of “retro” and “nostalgia” that are so often applied to the series. To be more specific, it seems far more modern than this annual. It may be that any reader in my shoes, i.e. one that has no previous experience with the ClanDestine, is likely to feel less excitement about encountering them here than someone who knows more about their backstory, but the fact is that they felt very dated to me, as did some of the other touches, such as the people in the sewers, a robot possessed by spirits, and the longest talking-while-fighting sequence in recent memory. The story reminds me of something that would have appeared in Daredevil in the 90’s. I have nothing against 90’s Daredevil (I really liked the first half of Chichester’s run and liked Kesel’s and Kelly’s respective runs even more), but there’s a time for everything and the vibe I got here didn’t quite feel like it belonged in 2012. While the Waid run and this Alan Davis annual seem to be set in different eras, they do have something in common: The use of old villains. Where Waid has brought back Klaw and Black Spectre, not to mention dusted off Mole Man and made him truly creepy, Davis takes a stab at bringing back the Plastoid. 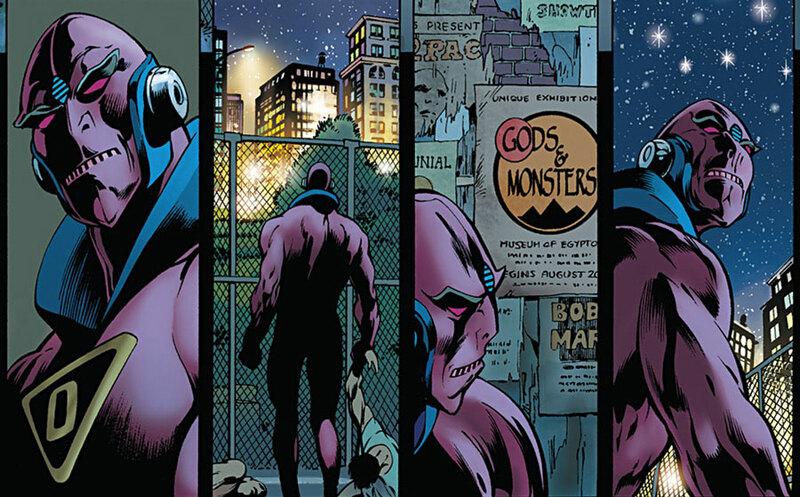 If you don’t remember the Plastoid, there’s no reason to feel bad, he hasn’t appeared in Daredevil since 1969, in Daredevil #50, in which he almost caused Matt’s demise in a most embarrassing manner. While I did get something of a kick out of seeing the Plastoid again, his use here seems like an odd choice, further adding to the feeling of this being a story from another time. There were highlights to this issue, the art being the main one (having series regular colorist Javíer Rodríguez onboard was a welcome touch of familiarity), but more than anything, it made me realize just how grateful I am to see how the main book is handled right now. Alan Davis is a skilled storyteller, certainly, but it’s hard to compete with the main series right now. Mark Waid seems like he was born to write exactly the book that Daredevil needs at this very moment in the character’s history. I enjoyed it for what it is , an untold tales set in the bronze age. It needed the ’70s “Daredevil” logo and Gene Colan’s cleft chin. I enjoyed it a lot. The action was fun and there were some details that are missing from modern DD tales. Here’s a Daredevil science question; how manytimes can DD ricochet his bill club and smack a target? What’s the record? I have my own theories, but how does he do this?